A report by aid organization Good Friends stating that widespread starvation is happening again in North Korea has been vehemently denied by inside sources. In the June report, Good Friends, citing its own sources, asserted that the Chosun Workers’ Party had dispatched an investigation team to each area of the country following the June 7th Supreme People’s Assembly meeting, and that the teams had found up to two hundred people dead in each district of South Hamkyong Province. Good Friends has tended to warn of impending mass starvation almost every year, but inside informants and the South Korean authorities often assert otherwise. In a separate report, Good Friends also recently claimed that there was to be no more public distribution as of late last month, and that market transactions had been fully liberalized to allow the people to look after themselves. However, the actual existence of the May 26th Measure has not been proven, and markets in Sinuiju, Pyongyang, Hyesan and other main cities remain open from 10 AM to 6 PM as normal. Because North Korea operates in secrecy and isolation, outside observers rely on informants and accounts from defectors. In this case, experts agree that the food shortage is dire. Several analysts who monitor and travel to North Korea agree that in recent weeks, Pyongyang has abandoned almost all rules about who can spend money and when. That would seem to indicate that Kim — who once equated free-market trading with “egotism” and a collapse of social order — now wants to rehabilitate markets that were damaged months earlier. IFES has also reported this move. Authorization of public market is included at the core of the 5.26 Party directives. The North Korean authorities decided to allow everyone to have access to markets and overturned their original plan to close down the general market and exercise strong control over market. They announced that there will be no time restrictions, product control or age limitation. In reality, they allowed Democratic Women’s Union’s weekly prohibition from market operation during official work so people can work at market regardless of Democratic Women’s Union hours. Their only condition was to participate in labor mobilization. Pyungsung City, which suffered the most since last year’s decision to prohibit general market, is now allowed to open business and cancel other market regulations. A city official described the background on allowing of the market, “The living standard drastically decreased since the currency exchange and the government cannot provide distribution so they have to bring market back up.” He added, “There are increasing deaths from starvation so opening market is a reasonable resolution. Death due to starvation has gone out of control.” However, although the market doors are open wide, products are not being distributed and there is no cash flow. Market has shrunk that a businessman who used to make 3,000 won a day is barely making 200-300 won a day. Good Friends is a valuable source of information but their reports should be taken with a grain of salt. As North Korea’s food shortages worsen and reports of starvation continue to grow, the Workers’ Party of Korea have acknowledged the failure of the central food ration program. Since the end of May, the Party has permitted the operation of 24-hour markets, and the regime has ordered the people of the North to provide for themselves. North Korea has completely cut off state food rations after China failed to supply the impoverished communist country with extra cereals, a welfare group said Monday. The ruling communist party announced in a directive on May 26 that there would be no state rations for a while, said South Korea’s Good Friends group which has contacts in the North. People were authorised to buy food supplies through private markets, it said, adding the directive was due to delayed shipments of food from China. “The directive was unavoidable” because China failed to send the aid which had been anticipated after leader Kim Jong-Il’s trip to Beijing in early May, group president Pomnyun, who uses just one name, told reporters. Private markets are now open around the clock across the North, he said. The North suffered famine in the mid-1990s which killed hundreds of thousands and it still grapples with severe food shortages. The UN children’s fund estimates one third of children are stunted by malnutrition. The state food distribution system collapsed during the famine. Free markets sprang up and were condoned for a time. Since 2005 the regime has been reasserting its grip on the economy, with controls or outright bans on the private markets. A currency revaluation last November, designed to flush out entrepreneurs’ savings, backfired disastrously, fuelling food shortages as market trading dried up and sparking rare outbreaks of unrest. The North was forced to suspend its campaign to curb the private markets. As inflation and food worries continue to grow in North Korea, social unrest is palpable. According to the group ‘Good Friends’, North Korean officials slashed prices on all goods to 1/100th of their going rate in an effort to ease the public. Considering the fact that North Korea revalued its currency by the same ratio on November 30, it appears that Pyongyang is effectively acknowledging the reform’s failure. The Good Friends newsletter reports that the Korean Workers’ Party cabinet had handed down an order to reduce the price of all goods by a factor of 100:1, while the people of North Korea were told during local meetings that currency was revalued at 100 to 1, but not in order to reduce the sale of goods by 100 to 1, as well. It also stated that at the first cabinet meeting in March, there was discussion on the fact that it was rumored that prices had climbed several times higher than official prices, and would continue to rise. It was decided that, at first, people thought of the currency reform as a 100-fold increase in prices, and that the same was true of management in state-run organizations. Later, at the second meeting of the cabinet, it was decided that a ‘100 to 1 Price Plan’ would be distributed to each city and town. Now, People’s Committees and security forces in each city and town are enforcing the ‘100 to 1 Price Plan’ while the central Party’s 100:1 commerce committee has distributed a class syllabus in support of the price modifications, which was lectured on throughout the country from March 16-18. This indicates that the government is again controlling all prices throughout the country. With no goods or aid flowing in from outside, it is likely that the price and exchange rates will continue to climb. On December 9, rice sold for 23 won, but the value of the new currency falls daily, and starvation is striking people in several areas throughout the country. Anger over government policies and general feelings angst are not hard to find in families and labor groups. The government is trying to control the prices of daily necessities, but if it is unable to do so, this situation cannot avoid becoming explosive. The central government has also sent officials out to different areas of the country to enforce a rice price of 25 won/Kg. This is the highest rice sold for in markets prior to the currency reform. Enforcing the same price throughout the country is an attempt to stabilize markets, and is a temporary measure to try to keep residents’ tempers from flaring. The November currency reform was the first currency revaluation in 17 years, and was part of a set of strong measures to restrict markets, along with market closures and bans on foreign currency. However, since last February, the inflation sparked by the currency revaluation has grown severe and internal unrest has increased, leading authorities to reopen markets and set price caps. Now, the price of rice in North Korean markets appears to have stabilized at 400 won per kilogram, but due to the unrest over the last 100 days, many middle-class residents have fallen into poverty. Suffering from severe food shortages, North Korean authorities ordered that markets be opened unconditionally, and that there be absolutely no crack-down on the sale of foodstuffs within the markets. This is according to a report issued on February 18 by the North Korean human rights organization ‘Good Friends’. Good Friends’ newsletter revealed, “After examining a report on food shortages and the conditions of residents in each region throughout the country by the Office of Economic Policy Review, the Central Committee of the Korean Workers’ Party issued an ‘Order for Absolutely No Regulation Regarding Foodstuffs’ to each law enforcement office.” The order stated that until central distribution is running smoothly, all markets are to be reopened as they were prior to recent government crack-downs, and that under no circumstances were authorities to try to regulate food sales. Furthermore, it reported that “the People’s Security Bureau also received the Central Committee’s order, and passed on a special instruction to each regional security office ordering agents not to crack down on markets for anything other than illegal goods, and not to regulate food sales, in particular.” Local authorities were also ordered not to engage in altercations with market traders and not to intervene or interfere in fights between traders working within the markets. In mid-January, Kim Jong Il called a meeting of Party administrative director (and brother-in-law) Jang Sung-taek and other high-level authorities in order to ease the side-effects of last year’s currency reform. A North Korean source relayed to Daily NK on February 17 that at the meeting, it had been decided that authorities would issue emergency rations to residents facing the threat of starvation. According to this order, the Office of Food Procurement has been tasked with distribution of the emergency food; neighborhood units receive 5 kg of food daily, while offices receive between 5~15 kg, depending on the number of employees. Neighborhood unit directors or factory supervisors are responsible for assessing the food needs of their neighbors or employees, and prioritize food distribution to those households at risk of starvation. Until the end of January, currency reform measures that banned the sale of food and drove prices up drove a significant number of households to starvation. However, since the emergency rations measure began to be enforced on February 1, there have been no reports of large-scale famine. You can read the full Good Friends report here. The Daily NK keeps a running graph of price and exchange rate information. See it here. Seoul-based Internet newspaper DailyNK also reported last week that bartering has made a comeback. “For now, state-designated prices are still not public, so people think that selling goods for cash now would mean making a loss,” it quoted a defector who talked to his family in the North as saying. The defector said the barter value of products is decided according to their value in old money, with trade carried out privately to avoid detection. Before the redenomination, one fish was worth 1,500 won and a kilogram of corn was 900 won, so people barter one fish for a little less than two kilograms of corn, DailyNK said. “The North Korean Cabinet has told agencies under each ministry and provincial and municipal chapters of the Workers Party that it will replace urban marketplaces with farmers markets that will open every 10 days starting Jan. 14,” the Group Good Friends said in a newsletter. “The cabinet also released market operating rules and a list of items that can be sold, adding that market traders will be permitted to sell only agricultural produce and indigenous local products but not Chinese goods or domestically produced industrial products.”Large markets began sprouting in the North in 2004, increasing to an estimated 300 by 2007. North Korean authorities decided to crack down on black-market traders who move around all the time to dodge the authorities, and back-alley deals for fear that the practices would run rampant if unchecked, it said. I have located approximately 200 markets in the DPRK using Google Earth. Links to locations of the Pyongsong, Chongjin and Hamhung wholesale markets can be found in this post. 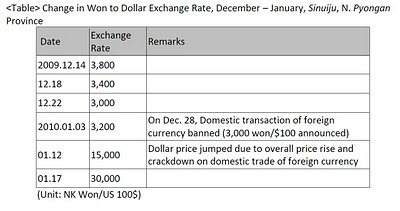 In accordance with the recent currency reform in North Korea, new state-controlled prices were officially announced on December 9. South Korean NGO ‘Good Friends’ announced on December 13th that rice is now selling for 23 won per Kg, corn at 8 won per Kg, flour at 22 won per Kg, pork at 45 won per Kg and ‘matnaegi’, a common flavor-enhancing food additive, is selling for 45 won per bag. Other prices were also listed per kilogram, including crushed maize at 12 won, corn noodles for 10 won, soybeans from 9-13 won, soybean oil for 50 won, radishes at 5 won, artificial meat for 15 won, and cowpeas for 10 won. On December 4, the Choson Sinbo, a newspaper printed by the pro-North Korean General Association of Korean Residents in Japan (Jochongryeon), reported that North Korean authorities were planning to lower prices to the same level as was seen when the July 1, 2002 Economic Management Reform Measure was enacted. 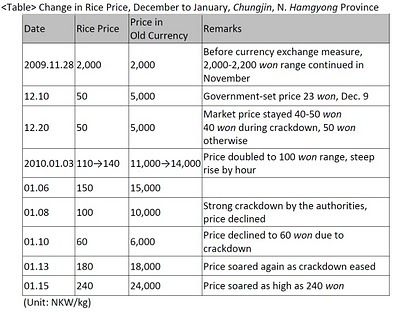 At the end of November, prior to the currency reform, rice was selling for 1,850 won in Hamheung, 2,000 won in Cheongjin, and 1,700 won in Pyongyang and Sariwon. In the markets of these four major cities, corn averaged 737.5 won/Kg, flour was sold for 1,687 won/Kg, and pork was 5,450 won/Kg. Pork is the only item now being sold more cheaply, while the price of all other goods went up with the currency reform. A source inside North Korea has reported that most market traders are not following government pricing guidelines, however, and that the majority of goods are being sold at even higher prices than Pyongyang has set. In the market in Cheongjin, North Hamgyeong Province, rice was being sold for 50 won/Kg, and corn went for 18 won/Kg, more than double government prices. These high prices appear to reflect supply shortages and hoarding. After the currency reform was announced, North Korean miners received raises, from a basic monthly wage of 6,000 won to the equivalent of 8,000 (pre-reform) won. Miners in North Hamgyeong Province can now put enough food on the table without needing second jobs. On December 4, the Choson Sinbo also reported that the government has guaranteed that living expenses distributed by factories will be distributed in the new currency. North Korea’s main wholesale market, in Pyongysong, was temporarily closed for just over a week during mid-April, but it has reportedly been open and operating normally since then. It was rumored, and reported [previously (see below)], that the Pyongysong Wholesale Market was shut down in mid-June. There was a report that officials felt the market had grown too large, and there was a plan to divide it into East and West Markets. However, reports of these plans have now been deemed nothing more than rumor. A source in Kangdong-gun stated that there has been much talk of closing markets since the beginning of the year, but that no measures have been enforced and everything is operating normally. Another source reported that many traders are traveling to and from Sinuiju and Pyongysong, and that their numbers have been growing since the onset of summer. While rumors still abound regarding market closures, the source noted that there is significantly less talk of such measures compared to earlier in the year. In January, North Korean authorities released a statement indicating that general markets would be transformed into farmers’ markets, and only open once every ten days. However, six months has already passed, and there has been no action taken. There have been no measures to transform even some of the largest markets, in Hyeryong, Hyesan, Musan and Sinuiju. That said, it is always possible that the North Korean authorities proceed with plans to close or transform the markets. The majority of North Koreans trading in the markets do not believe the authorities could easily carry out market-closing measures. Due to the likelihood of large-scale civil revolts, the regime must come up with an alternative to the markets if it intends to close or transform them. The current food issues faced by the North make it impossible to close markets. In addition, transforming general markets into farmers’ markets would force residents to buy daily necessities and other manufactured products at department stores or government-run shops, but these shops have nothing in stock. Furthermore, preventing residents from selling in the markets makes it more difficult for them to acquire the food necessary to sustain themselves and their families. The number of empty stalls in markets appears to be slowing increasing, but a complete shutdown of the market would likely lead to protests. It has been reported that North Korea’s market closing measure is slowly beginning to be enforced. The June 23 27* issue of North Korea Today, a newsletter from the South Korean group Good Friends, announced that the Pyongsong general market has now been shut down, in what some call the most prominent omen that all general markets will be shut down throughout the country. As the Pyongsong general market served as the central wholesale market for the entire North, some believe it was shut down first in order to encourage the use of smaller, more local traditional markets. In addition, central Party authorities have ordered department stores and general stores in Pyongyang to stock up on Chinese goods. The North Korean government has announced, on a number of occasions since last year, that general markets would be closed and turned into farmers’ markets, but for a variety of reasons, the measure has been on hold for over six months. Regional authorities were also ordered to import various goods from China, in accordance with the demands of local citizens and regional conditions, in order to head off any concerns that daily necessities might not be available after the markets are closed. This series of measures indicates that the government is concerned that attempts to forcefully close the markets may lead to citizen revolts, as clashes between traders and police occurred previously when the North attempted to enforce market restrictions. One official in Pyongyang stated that this measure put citizen’s concerns and inconveniences first, stating, “[The Party] must unconditionally get rid of markets. But on the inside, they see that there will be huge opposition from the citizens if they only use force, so this time they decided to combine it with conciliatory policies.” The source added, however, that authorities plan to continue to operate restricted markets while at the same time, completely changing the market system before the end of this year. Despite North Korean official attempts to shift general markets onto an agricultural format, the general markets are operating as normal because of popular resistance to change. You are currently browsing the archives for the Good Friends category.